And below is my inspiration board for the space. Live edge shelves for all of my vintage bottles and glassware, white subway tile, pendant lighting and two of my favorite vintage ads on the back wall (hoping to fit a little breakfast nook back in that corner). 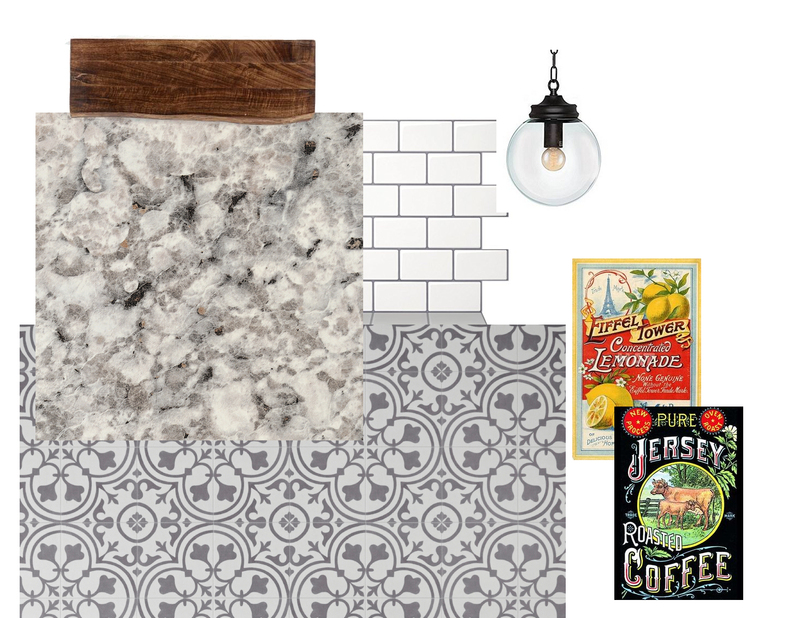 The flooring pictured is Mannington’s Deco in Wrought Iron (same brand we used in the bathroom update). Isn’t it amazing? 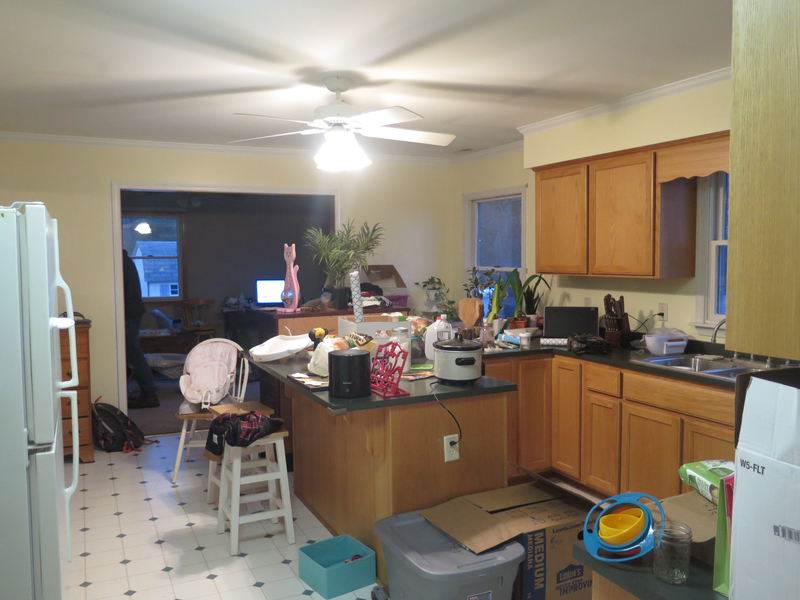 Anyway, back to how I inadvertently started the kitchen update. 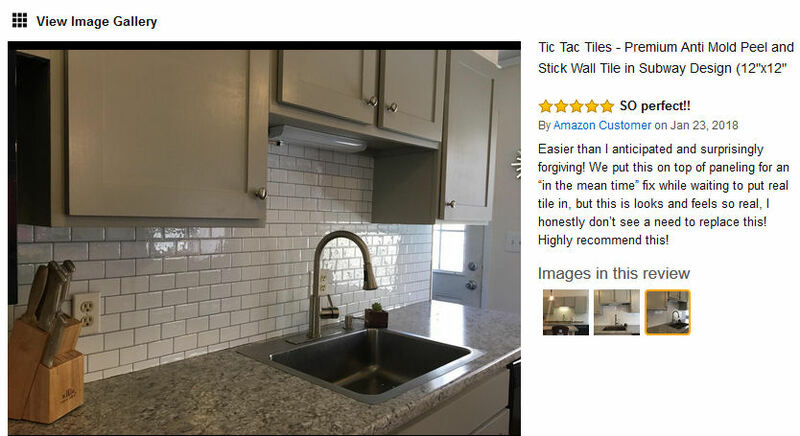 Browsing Amazon I found these adhesive stick on subway tiles and thought they’d be perfect to complete our much needed backsplash on a budget. I read through all the reviews and was super impressed. I mean, check out the image below, it looks so real! 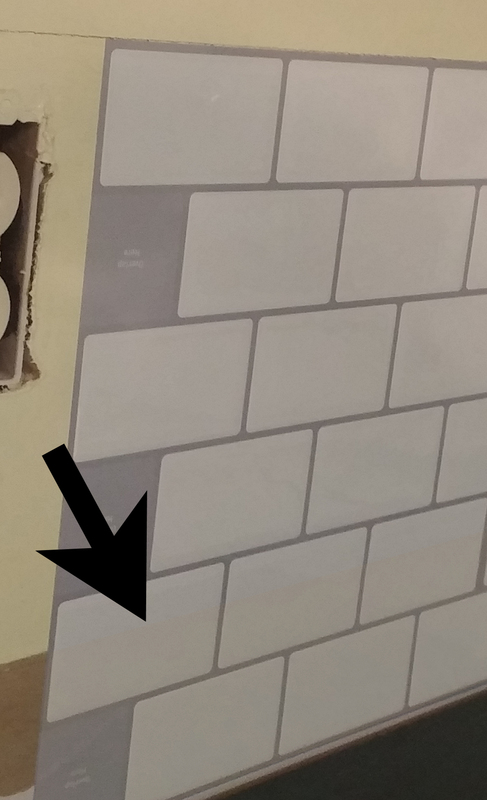 Unfortunately, the tiles when installed on our wall were see through and the brown part of the wall was peeking through. Yikes! Tic Tac Tiles customer service was amazing though. They tried to help us troubleshoot why this happened and in the end they gave us a full refund. 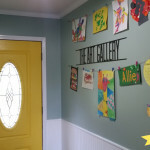 I wouldn’t hesitate to recommend this product if your walls have less contrast than ours. We ripped off the three adhesive sheets we had placed… which removed everything and we were left with bare drywall. Unfortunately… (again) the area we initially started was next to the sink and we were concerned about water damage so needed to quickly figure something else out. 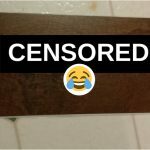 Luke has never done ANY tile work but we priced everything out and realized the real deal would be within $120 dollars of what the adhesive sheets would have cost. 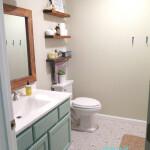 I admit I was a little skeptical that this was really a DIY project, but we took a trip to Home Depot one Sunday afternoon and picked up enough of these mini subway tiles to do our space, this Simple Mat product, and some Pre-mixed grout in Delorian gray and by Tuesday morning this is what we had! It’s so beautiful! Good job babe!